Peel and cook the potatoes in salted boiling water. Mash the potatoes with the butter and salt and pepper in a bowl. 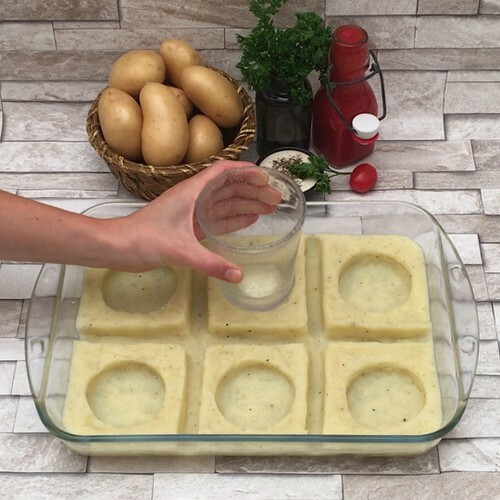 Spread the mixture into a rectangular oven dish, and use a wooden spoon handle to indent lines in the mash and make 6 squares of potato. Use the base of a glass to make holes in the middle of each square. Pour tomato sauce between the squares, and bechamel white sauce in the holes. Mix the mince, chopped parsley and salt and pepper together in a bowl. Roll the mix into 6 meatballs and place one in the middle of each hole. Garnish the meatballs with grated mozzarella and then bake in the oven for 25 minutes at 180°C. Enjoy the slices hot with salad on the side.